Item #42445 : Original period manufacture. Based on a Dutch design of 1898, but US made and adopted by our Navy as the M1917. The official US Navy models often will have the letters USN on their ricasso's. 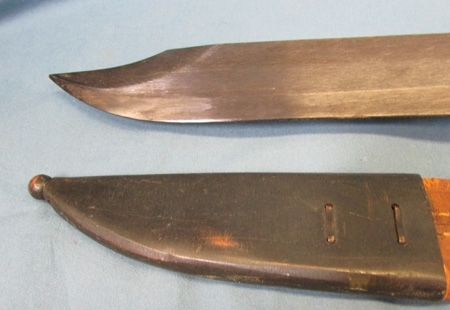 These were also commercially produced and provided to the Dutch East Indies forces after the Netherlands were overrun by Germany in 1940.The blue finished blade is quite sound, no nicks in the cutting edge or pitting, with a nice finish to the steel surface. Matching finish to the basket guard with light surface corrosion on its surface. Black, hard rubber grip plates, secured with three brass rivets. There is a near imperceptible bend in the blade, just a hint really. 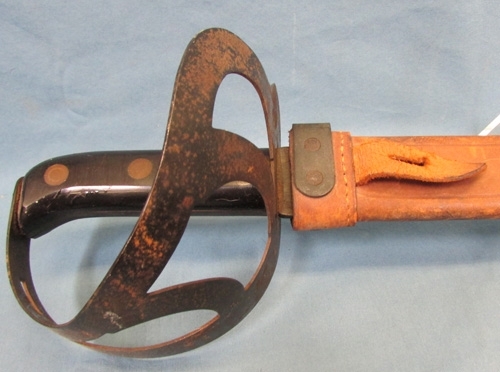 Russet colored leather scabbard, slightly dry to the touch, but not dusty or flaking, except on the short throat strap. Dark finish to the alloy throat and chape, with the lower section being dented.